These days you can get a bowl meal at any restaurant, grocery store, or even fast food joints. Everything from burrito bowls to poke bowls to regular taco bowls, these healthy meals have become massively popular in recent years. The latest trend now is “buddha bowl”, which ultimately just means a big bowl filled with a variety of nourishing ingredients that are healthful and vibrant. A buddha bowl makes for the easiest weeknight meal. When you use salmon fillets (like in this recipe), cook time is reduced even more and you get all those healthy omega-3’s in. One of the best reasons to include buddha bowls into your ketogenic meal plan is they are a wonderful way to get low glycemic vegetables, nutrients, and fiber each day. Buddha bowls help you eat the rainbow. Additionally, because these bowl meals usually require a flavorful sauce, they are also a great way to include powerful herbs, roots, and spices into your keto diet. 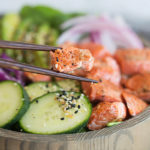 This salmon buddha bowl gets most of its flavor from the sesame garlic salad dressing, but using fresh ginger root in the quick marinade will also provide a whole new layer of medicinal benefits and delicious flavors. Not only can ginger root help reduce blood pressure, it can also lower your LDL or “bad” cholesterol and lower triglycerides. Studies have shown ginger root may be as effective as common medication prescribed to treat high cholesterol. One of the main reasons why ginger has been used for centuries in ancient medicine is due to its soothing effects on the stomach. It can help reduce nausea, treat morning sickness in pregnant women, and treat chronic indigestion. It also contains a compound called gingerol, which has powerful antioxidant and anti-inflammatory effects. Ginger is rich in antioxidants and bioactive compounds that help fight oxidative stress in your body and brain. Studies have shown ginger can enhance brain function directly by improving reaction time and boosting memory. A little goes a long way with ginger and it doesn’t take much of this powerful ingredient to make a big difference. And if you are not a big fan of salads, easily serve this salmon buddha bowl over cauliflower rice, as a stir-fry, or simply with some roasted veggies. If you haven’t already fallen in love with bowl meals, healthy recipes like this one will do the trick. Pro-tip: Make your life even easier during a busy week by doing a little bit of meal prep and pre-chopping all of your vegetables. Place marinade ingredients to a small bowl or zip lock bag. Add salmon and let marinade for up to 1 hour in the fridge. Preheat a large skillet, non stick pan, or grill pan and coat with non stick spray or butter and set to medium-high heat. Cook salmon on each side for 3-4 minutes until golden brown and medium well on the inside. Remove from heat and let cool. Cut into small pieces if desired. Salmon can also be cooked in the oven on a baking sheet if desired (10-12 minutes at 400 degrees). Assemble bowls by adding lettuce, veggies, and salmon. Add garnish, sesame seeds, herbs and top with Perfect Keto Sesame Ginger Dressing or dressing of choice.